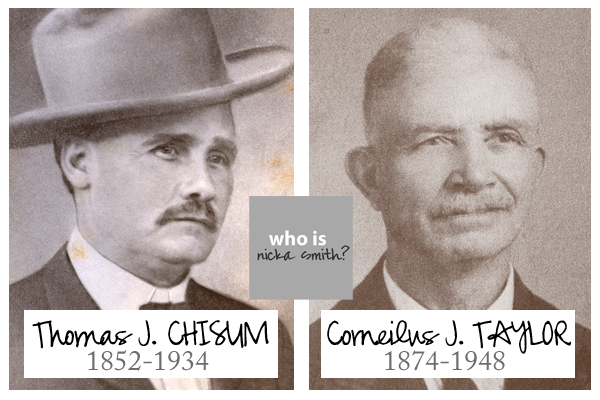 His name is Thomas Jefferson Chisum - who is nicka smith? Some time back, I called out to the genealogy world to reveal the names of their people in their lineage who were both slaveholders and ancestors, or what I called slavecestors. In the course of identifying my own, I discovered the names of some of my definite slavecestors and the level of endogamy amongst them almost drove me batty. You’re probably wondering what was so special about today and I’m sitting here typing this thinking the same thing. LOL If you’ve been doing genealogy research for some time, you realize that there are just days when all the pieces fall into place and it’s like records or confirmation of things just start falling from the sky. This is after you’ve spent eons looking for these things and then BAM! They just like…appear. Me and a group of my genetic cousins have been trying to crack the code of my slavecestors for nearly two years. Me and my mother are usually the lone people of African descent. My relation to these groups is on my maternal grandfather’s side, which I detailed in an earlier post. I have a list of running names, notes coming out of the wazoo, and a Genome Mate database bursting at the seams. My assumption was almost always that the relation had to have been created during slavery. It just seemed to make the most sense, right? But what if I was wrong…at least in this case? What if the relation occurred after slavery? After some digging, I surmised that whoever my ancestor was had to be a descendant of both John Chisum and Ellender Gillington/Gillentine and Anna Chisum and John Walling. Not only that, but they had to have lived within or had ties to Concordia and/or Catahoula Parishes in northeastern Louisiana in order for them to have interacted at all with my maternal grandfather’s family, in particular my great grandfather, Corneilus James Taylor. I had more than solid evidence on their whereabouts. So, I set out to create my list of “suspects.” One by one, I combed through my DNA matches and their family trees to see if someone, anyone, was a descendant of the couples above and lived in, traveled through, or even sneezed the parishes in question. I didn’t come out with anything at first…that is, until I Googled the words “Chisum” (and derivatives) along with the parishes in question. Thomas Jefferson Chisum. (1) Hmm. Is HE related to the couples above? Why yes, he is. He’s the Chisms great great grandson and the Wallings great grandson. Enter this record from FindAGrave. Lots of names mentioned. Many of them whose descendants are prominently featured in my DNA results ranging from second cousins to fifth cousins. Surnames like Meek, Steele, and Gray. As time went on, Thomas’ father, Isham/Isom Russell Chisum, and his brother in law, William Meek, even showed up as a New Ancestor Discoveries for me on AncestryDNA. In all, 11 DNA matches had direct ties to one or both of these New Ancestor Discoveries. The amount of DNA they shared was from 10-40cM. Then I sat and looked at his picture. Thomas looked familiar. Not the “I’ve seen a man walking around who looks like him” familiar but more of a “You look like someone else in my own bloodline.” I then did a side by side to make sure my eyes weren’t playing tricks on me. I knew I had to be wrong. I just knew it. I shared the images with several people to make sure I wasn’t “trying to make this be something it wasn’t.” Every. single. person. All of them said “That’s the same man, just later in his life, right?” So, I dug further. The enumerations were only 3 pages away from each other in the same ward and parish/county which usually indicates that they lived in close proximity to each other. Thomas was old enough to have been Cornelius’ father. But without a willing direct male descendant on my side to test, what other circumstantial evidence did I have? None of the research I’ve found on online digs deep into Thomas’ dealings while he lived in Concordia Parish but highlights his life after he got to neighboring Catahoula and married his wife, the former Kate Smith of Catahoula Parish, LA. (4) Many sources, including this one, note that he arrived in Louisiana from Texas as a horse driver. The exact date varies but we know he was in Concordia Parish, LA by 1880. There’s additional irony that Corneilus’ nickname was Red Horse. Oral history in the family states that Corneilus was born in Mississippi and several records (including the 1880 US Census I just mentioned) have confirmed this while others have noted Louisiana as his birth place. The area they lived in while in Concordia Parish is right on the state line between Mississippi and Louisiana. Regardless, both Thomas (5) and Corneilus (6) were in Catahoula Parish by 1900. 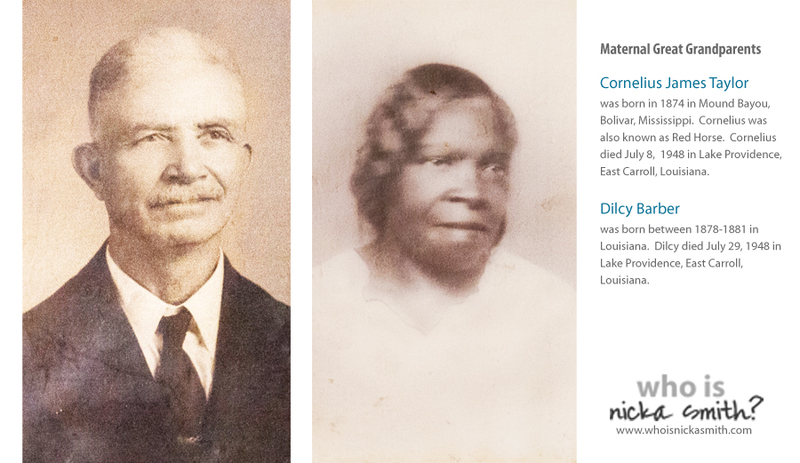 Corneilus also married a woman from Catahoula Parish, my great grandmother, Dilcy Barber Taylor. (1) “Louisiana Deaths Index, 1850-1875, 1894-1956,” database, FamilySearch(https://familysearch.org/ark:/61903/1:1:FSB5-GQ9 : accessed 31 December 2015), T J Chisum, 04 Dec 1934; citing Sicily Island, Catahoula, Louisiana, certificate number 14281, State Archives, Baton Rouge; FHL microfilm 2,180,091. (2) “United States Census, 1880,” database with images, FamilySearch(https://familysearch.org/ark:/61903/1:1:MD62-PML : accessed 31 December 2015), T J Chisum in household of A J Ragland, 8th Ward, Concordia, Louisiana, United States; citing enumeration district ED 24, sheet 126B, NARA microfilm publication T9 (Washington D.C.: National Archives and Records Administration, n.d.), roll 0452; FHL microfilm 1,254,452. (3) “United States Census, 1880,” database with images, FamilySearch(https://familysearch.org/ark:/61903/1:1:MD62-RPH : accessed 31 December 2015), Cornelius Taylor in household of Robt Taylor, 8th Ward, Concordia, Louisiana, United States; citing enumeration district ED 24, sheet 128A, NARA microfilm publication T9 (Washington D.C.: National Archives and Records Administration, n.d.), roll 0452; FHL microfilm 1,254,452. (5) “United States Census, 1900,” database with images, FamilySearch(https://familysearch.org/ark:/61903/1:1:MSPY-DGV : accessed 31 December 2015), Thos J Chisom, Wards 1-2, Catahoula, Louisiana, United States; citing sheet 1A, family 10, NARA microfilm publication T623 (Washington, D.C.: National Archives and Records Administration, n.d.); FHL microfilm 1,240,561. (6) “United States Census, 1900,” database with images, FamilySearch(https://familysearch.org/ark:/61903/1:1:MSPY-2LV : accessed 31 December 2015), Cornelius Taylor in household of Albert Hubbard, Wards 1-2, Catahoula, Louisiana, United States; citing sheet 24A, family 456, NARA microfilm publication T623 (Washington, D.C.: National Archives and Records Administration, n.d.); FHL microfilm 1,240,561. Great work, Nicka! I look forward to seeing how this turns out. I definitely think you’re on the right track, and “on to something”! I’ll be following along! What do you suggest when your slavecestors are runaway slaves that “passed”? I have the reward notice from when they ran, so I know their owner – actually a pretty prominent man in DC in 1823. I’m new to researching African American genealogy so any tips would be great. Hi Beth! I would suggest a couple things. Do a broad sweeping search of census records following their escape using their first names only or surname only in states that were free just north of the slaveholding state. You could also use DNA to try to track down relatives on that particular line who know the changed names but not the names beforehand. Lastly, it’s highly possible that family members of theirs were still enslaved and didn’t escape. 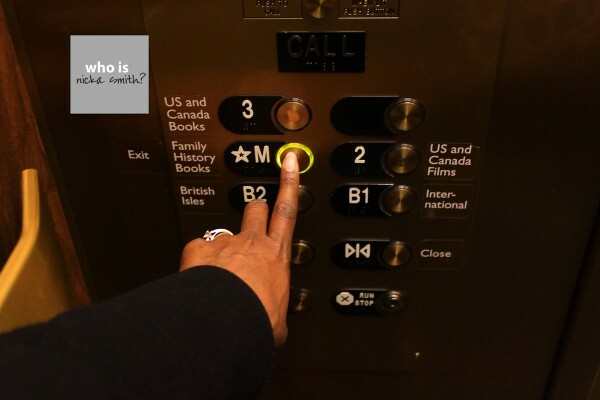 This means they have descendants. Try to track down as many living people who are tied to those who lived to see freedom and use traditional genealogy and perhaps DNA to solidify relationships.